Offering Only the Very Best! How is European-Influenced Laser Tag different from the Standard Laser Tag games? European-Influenced Laser Tag is easier because you don't have to run around in a five pound vest that covers your entire body, leaving you to become fatigue faster especially in the summer heat. The only thing you are wearing is a headband that connects to an adjustable cord - connecting you to the laser tag gun. So who exactly can play Laser Tag? Anyone! We have loved seeing little tots play with their grandparents and great-grandparents. 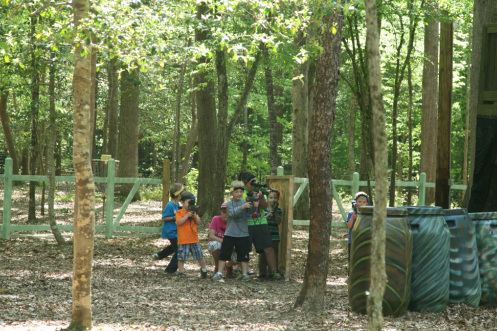 The Laser Forest was designed to be a Paintball field but we only wish to stick with the painless and environmental-friendly Laser Tag as our goal at the Park is to not leave anyone out. Please note: Our referees might have to withhold potential players from playing due to crowd control, the height restriction (36 inches), or inability to listen to the referees or play nicely with the other players. Whats different about our laser tag arena? We were really happy to present Laser Forest, a field that was admired by even seasoned paintball players. In just over 2 acres you get to run within it's fenced border and and hide behind tree or three other man-made objects, such as the bunkers, barrels, or teepees. This place is so amply mulched and well groomed that you won't find yourself looking for missing roots as you skip, dodge, or duck behind trees and barriers. And even if you fall you won't have to wipe off a scrapped knee - but we have a first aid just in case! 1. Please keep your headband on at all times. Don't let it fall down and wrap around your neck; this will become a choking hazard. If you have any problems with your headband during game play, please see an adult or a referee for assistance. 2. Please do not leave the fenced in area during game play. Please do not climb up the observation tower as that is for parents with cameras and referees only. 3. Please do not throw your gun around or grab/touch another player's gun. This can harm the other player and the referee can use his/her controller to disable your gun and send you out of the game. 4. Please do not drag the headband or the gun itself by the cord as it will break the hardware that is inside the Laser Tag gun. We ask that everyone treats these Laser Tag guns with the utmost respect as it would cost a lot of money to replace or repair. 5. Please listen to the referees as they are there to ensure that you enjoy yourself during game play. Please follow their instructions and if you have a child playing a game of Laser Tag, please be sure that your child is following the referees' instructions during his/her game play.